Roger Kornberg received his undergraduate degree in chemistry from Harvard University, USA, in 1967 and his PhD from Stanford University, USA, in 1972, studying the motion of lipids in cell membranes. He was a postdoctoral fellow and member of the scientific staff at the Laboratory of Molecular Biology in Cambridge, UK, from 1972 to 1975. He joined Harvard Medical School in 1976 as an assistant professor in biological chemistry. Kornberg returned to Stanford in 1978 as a professor in structural biology. He served as department chair from 1984 until 1992. He is the Mrs George A. Winzer Professor in Medicine at Stanford University School of Medicine. His recent honours and awards include the General Motors Cancer Research Foundation's Alfred P. Sloan Jr Prize, the Pasarow Award in Cancer Research from the Pasarow Foundation and Le Grand Prix Charles-Leopold Mayer from the Académie des Sciences in France. He is also a co-recipient of the Merck Award from the American Society for Biochemistry and Molecular Biology. In 2006 he was awarded the Louisa Gross Horwitz Prize by Columbia University. 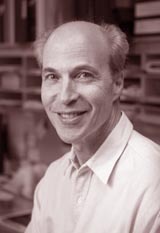 Dr Kornberg is a member of the National Academy of Sciences and a fellow of the American Academy of Arts and Sciences. His father Arthur Kornberg, PhD, was awarded the Nobel Prize in Physiology or Medicine in 1959 for studies of how genetic information is transferred from one DNA molecule to another. The Kornbergs are the sixth father and son team to win Nobel Prizes, in addition to one father and daughter team. The information on this page is based on content from the Stanford Report. Photo reproduced with permission. Credit Linda A. Cicero/Stanford News Service.